Ellen/Reid: I suppose one can take singular pride in that I didn’t venture once this holiday season over to Charlotte’s showpiece mall less than a mile away. You guys made shopping (online) incredibly easy so there was no need to fight the traffic or the shopping zealots. Actually, it likely would have been faster to walk to the mall than drive and try to find a parking space. The traffic was just bonkers over and around the mall and there was absolutely no need to watch the Santa machine churn through a line of whining kids while parents flashed a credit card for photos. I do reserve the right to go over for the post-Christmas sales once the crowds have died down, however. Some friends have cajoled me to play golf on both Christmas and New Year’s Day and that seems like a pretty good idea. 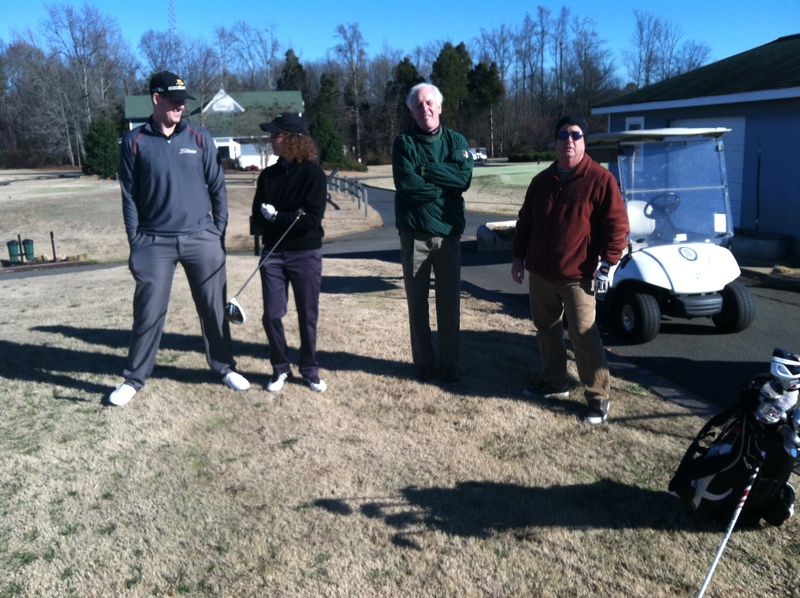 What seemed like a good idea on paper – play golf on Christmas day – had disaster written all over it. It was 28 degrees at the start. This photo doesn’t begin to show all the shivering. I don’t mind being down here for the holidays, and I know what kind of pressures are on you guys to go hither and yon. It’s good your mom is in the Twin Cities with both of you. John has invited me over to dinner with his family after he’s done preaching the Christmas Eve service at Caldwell Presbyterian. A mild protest was made to not interfere in his precious family time, but secretly I didn’t mind being asked. It’s good of him and he’s a good guy. I’ll take over some of that breakfast bread they can bake Christmas morning. I’ve got a soft spot for the environment but as of late it has hardened a little bit. As long as I’m above ground, Ellen and Reid will continue to know the land and water is worth caring about. Ellen/Reid: This week felt like an episode on the Animal Channel. It was amazing to see that owl eating the hawk a few feet away from me on Friday night and only a few yards off of six lane Fairview Road. Too bad my iPhone camera went into meltdown mode. 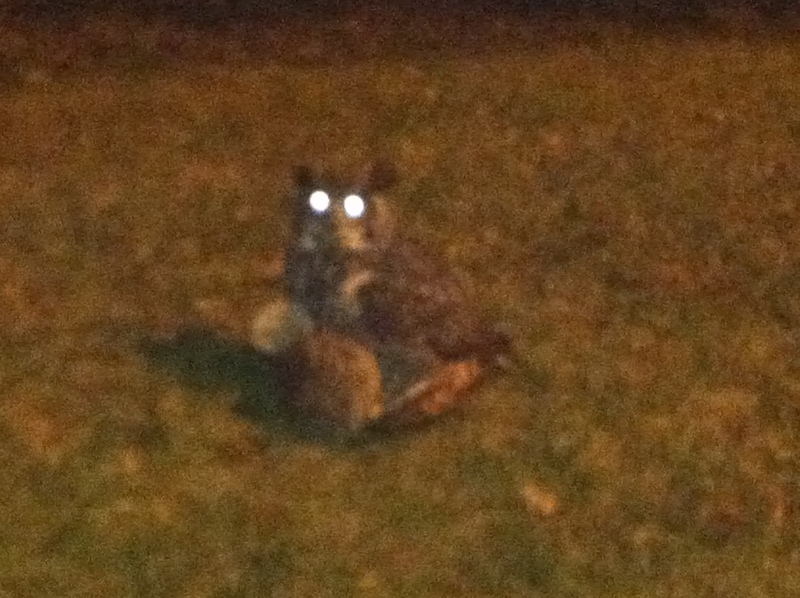 The owl sits atop its prize. Not 20 feet away, three lanes of traffic each way zipped by on Fairview Road. The variety of snake is somewhat a mystery to all but herpetologists, but what is known is all it wants to do is survive. And it shall. with me and while I have trouble hitting the ball I would have had no trouble clobbering him. Nah, I never would have throttled him/her. He/she was just trying to survive. Let him/her live and be on his/her way. 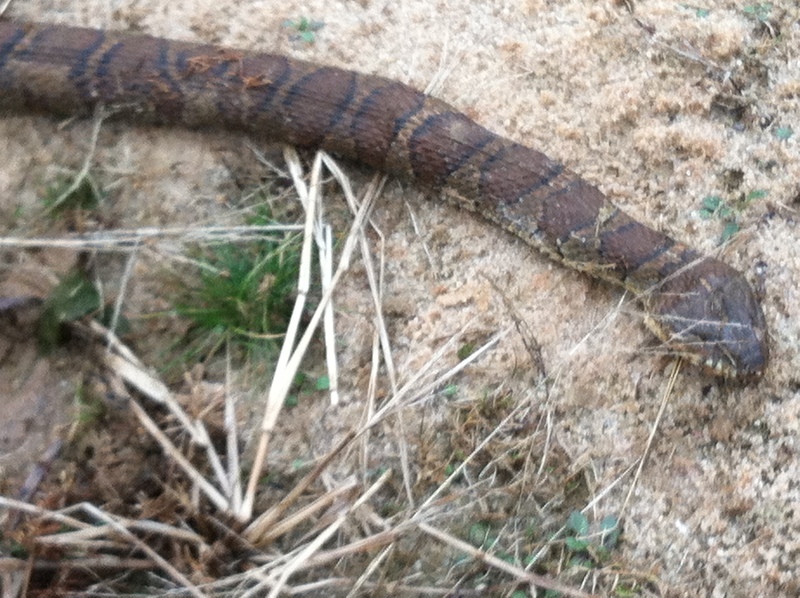 Why a snake isn’t hibernating is beyond me. A couple of holes later, a small flock of turkeys was moseying across the fairway and in no real rush to escape just another hapless golfer such as they’ve seen before. I like see all that life in motion in the middle of the city. They persevere despite the odds. 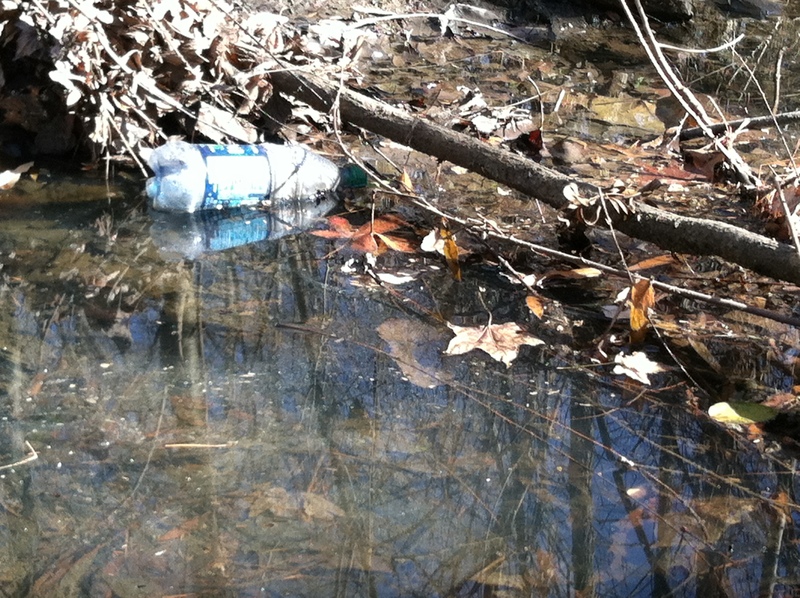 What I don’t like seeing, at this moment and as we speak, is the water bottle floating in the stream behind the house. I retrieved a plastic milk jug and several polystyrene cups bobbing up and down this weekend. We just can’t seem to get out of our way, environmentally speaking. Alas, trips long in the planning come to an end all too soon. All you have are the memories of a week that was. 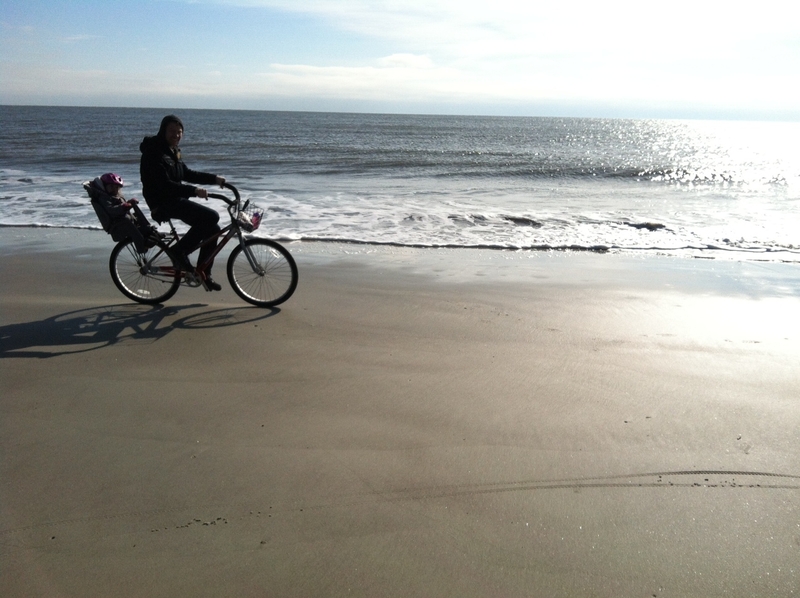 Reid and his niece Emma take a spin along the shore at Hilton Head. Dad was on foot. All the better to watch my crew whiz by. There was no letter last week to Ellen and Reid. 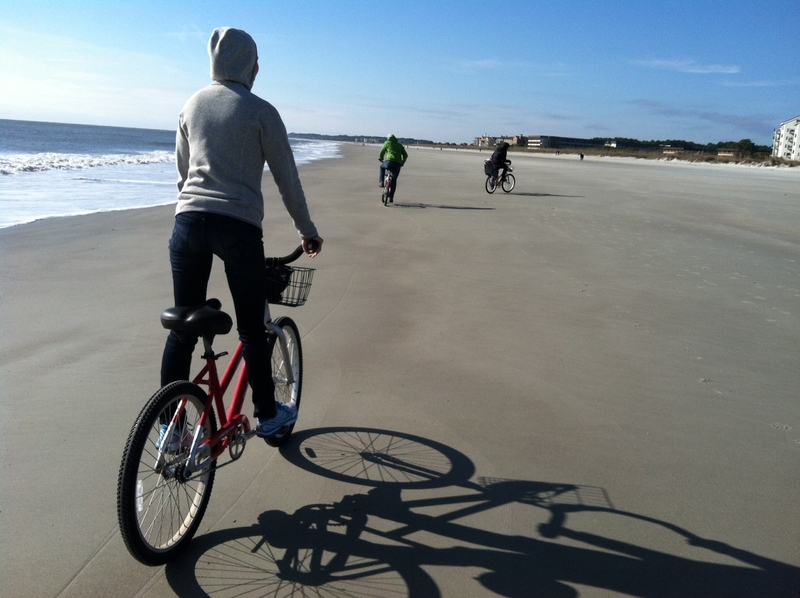 The kids were coming to Hilton Head Island for Thanksgiving; there was no need to write. Ellen and Reid: I’m trying to think of the last time I wrote the words ‘I love you’ to the two of you, and nothing comes to mind. Ellen, Tim, Emma and Reid cruise an all but deserted beach. and walking and cautioning me against that extra piece of pie, I couldn’t help but think how swell you guys have turned out. Not that their parents are in the rear view mirror, but Ellen and Reid have rolled on with their lives. I like that. people. That is probably the big thing; how you care for others, your sensitivity to those with less, your sense of fair play and your plain smarts. You’ve gotten by without us, but isn’t that the point? You have given us a lot to be thankful for, not only today, but in your formative years gone by and most likely the years ahead, too. So let me say ‘thank you’ for who you are and who you each have become. 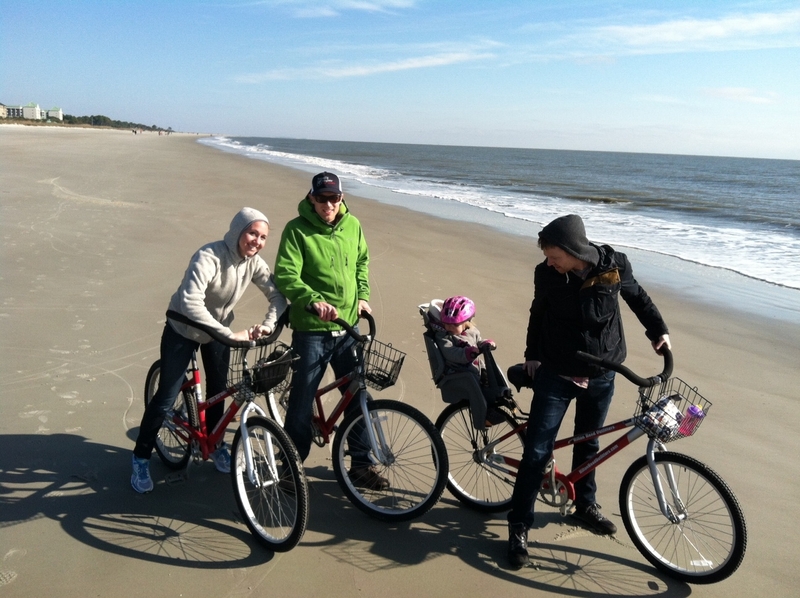 Allow me to look ahead to Christmas but not from the angle of gifts; you gave me everything this weekend in Hilton Head. There’s nothing else a proud dad needs or wants.